If your XP Setup Source is an ISO file, then first install ImDisk driver so that you can mount the ISO in a virtual drive. Use PStart > Edit > Add file to select imdiskinst.exe from U_XP_SET\USB_XP_Setup\makebt folder and Run to install ImDisk driver. Then Launch Notepad from cmd window or from PStart Menu. In Notepad Select File > Open to get the FileSelector which can be used as File Browser for All Files. Then with R-mouse on the ISO file you can use the ImDisk context menu to mount the ISO in a Virtual Drive. If your Setup Source is a folder on HDD or USB or a CD/DVD drive then you don't need to use ImDisk. Some more Windows 7 files are added to Windows PE 3.0 for Support of e.g. Date and Time and Region and Language. Parts of the Windows 7 registry are collected in folder WIN7_reg as raw material to make the PE3-SYSTEM and PE3-SOFTWARE reg files. Windows PE 3.0 + GUI (and Win7PE and Win7RescuePE) can after boot further be improved by Install of PnP Hardware. Running HWPnP to Install All Hardware followed by Scan for Hardware Changes in Device Manager will Install almost all PnP Hardware. Only HD Audio and VGA remain visible as Devices which need driver update. by having a GPT partitioned harddisk booting in UEFI secure mode through efi folder on hidden FAT32 boot drive. XP is not compatible with GPT partitioning and is not compatible with UEFI boot mode and XP drivers can be incompatible with modern hardware. but Win7 VHD's can NOT boot when located on GPT partitions and Win7 is not compatible with UEFI boot mode. Win7 VHD's can boot in BIOS mode (= CSM mode), when located on NTFS partition of MBR parttitioned harddisk. 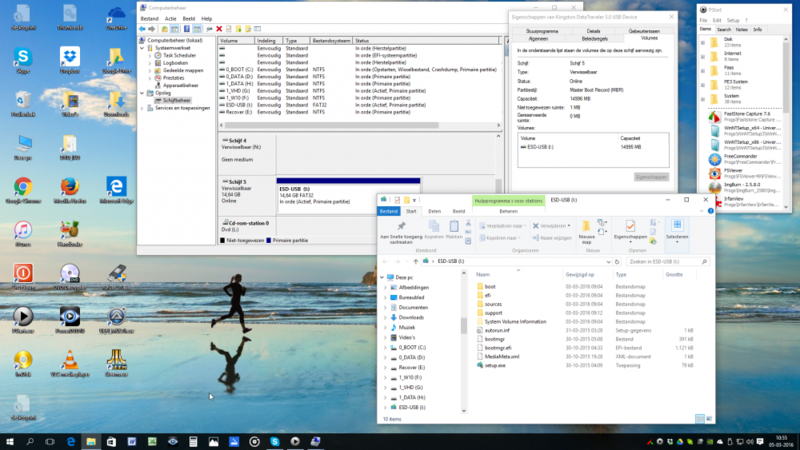 Download Media Creation Tool and use it to make USB-stick bootable in UEFI mode with Setup for Win10_x64. After booting from USB-stick you can Install Windows 10 x64. In case of UEFI then Install of Windows 10 requires on most hardware a GPT partioned harddisk e.g. as partioned by Setup in Unused space. This procedure is the standard for Install of Windows 10 x64 on Unpartioned harddisk and creates efi + windows partition for booting in UEFI mode. From inside Windows Setup, press Shift+F10 to open a command prompt window. 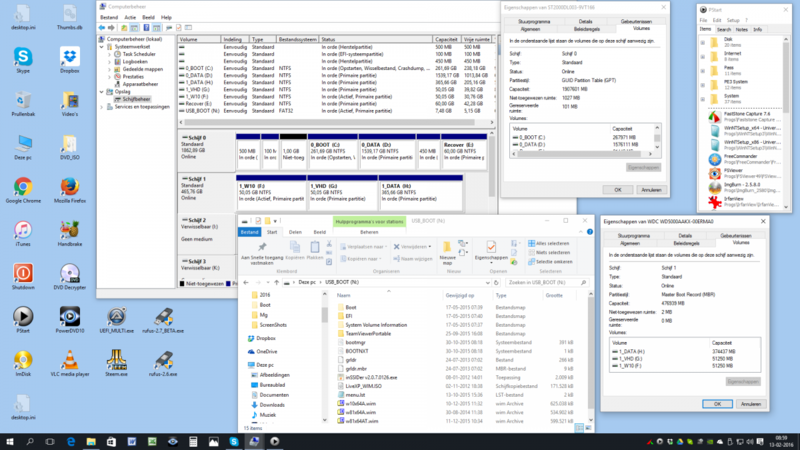 Use portable RegistryBackup and create a schedule so that you always have a recent backup of all your registry settings. 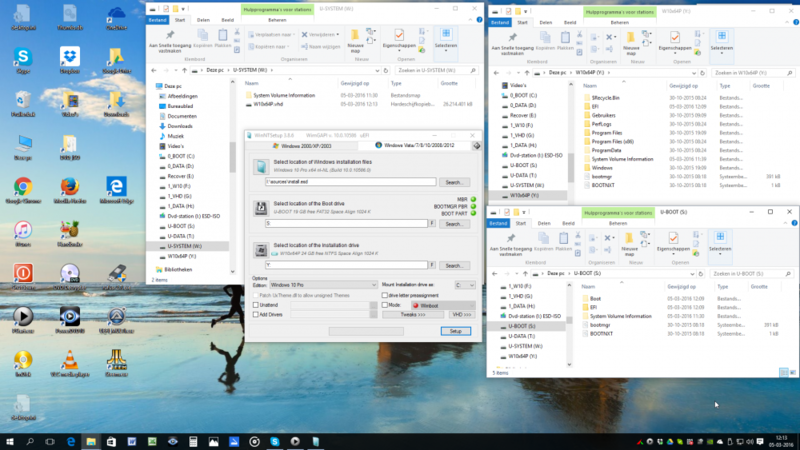 It is best to have your user data (Documents, Pictures) located on a separate partition, so that you can Restore your System without loosing Data. Use SyncBackFree to backup your data and make such backup on USB-harddisk so that you can keep it offline. 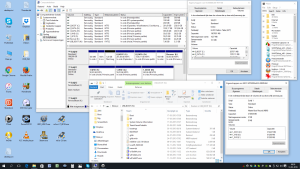 Use AOMEI Backupper to make a System Backup that includes EFI + Windows partition, so that you can Restore the System after booting with Win10PE. 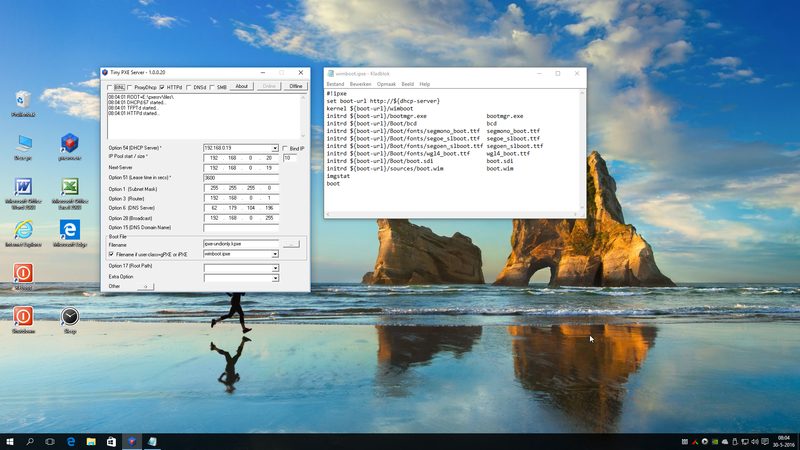 Use ProduKey-x64 online Or in Win10PE use WinNTSetup x64 program menu Offline to Save your Product Keys from Windows. You need the Product Key to Activate Windows when you add an SSD and do a fresh install of Windows 10 on the new SSD. Use BOOTICEx64 to make a Backup of MBR/PBR BootSectors and of your PartitionTable, needed to repair your Harddisk in case of attack. PowerShell can be used to remove unwanted modern Apps in Windows 10. The command shell:appsfolder presents a window with icons for all apps, so that you can make e.g. a desktop shortcut for Microsoft Edge browser. 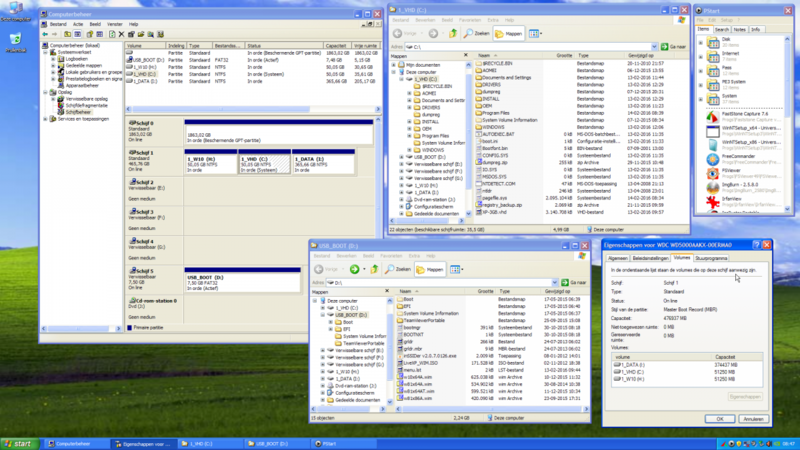 Windows Disk Management and e.g. 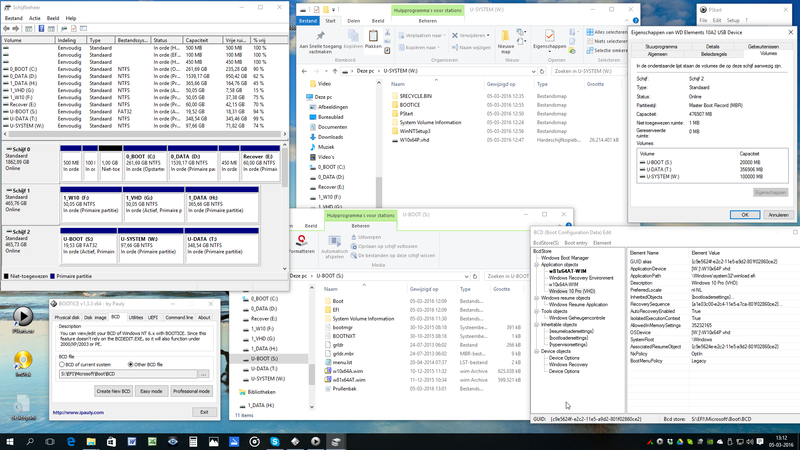 AOMEI Partition Assistant can NOT be used to create efi GPT partition and in that case Setup of Windows 10 will fail. DiskPart is really needed to make efi partition having the proper Partition type GUID, as made e.g. by the code given below. rem == In DiskPart use list disk to find disk number and adjust partition sizes and label as necessary. On some hardware Install of Win10 x64 is possible for UEFI booting on a MBR partioned harddisk with FAT32 Boot Drive and NTFS Installation partition. 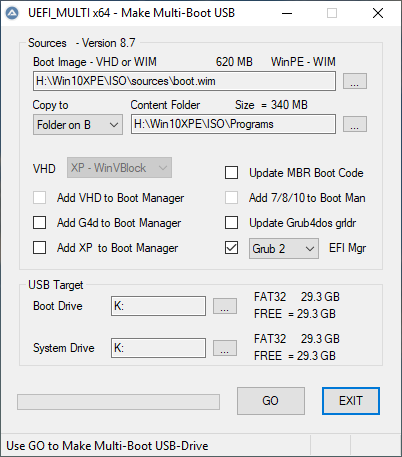 MBR-FAT32 booting of USB-Stick with WinPE WIM files and of portable USB-harddisk with WinPE WIM and VHD files is always possible in UEFI and BIOS mode. An example is the Media Creation Tool of Microsoft that creates MBR-FAT32 USB-stick for Install or Repair of UEFI or BIOS computer. 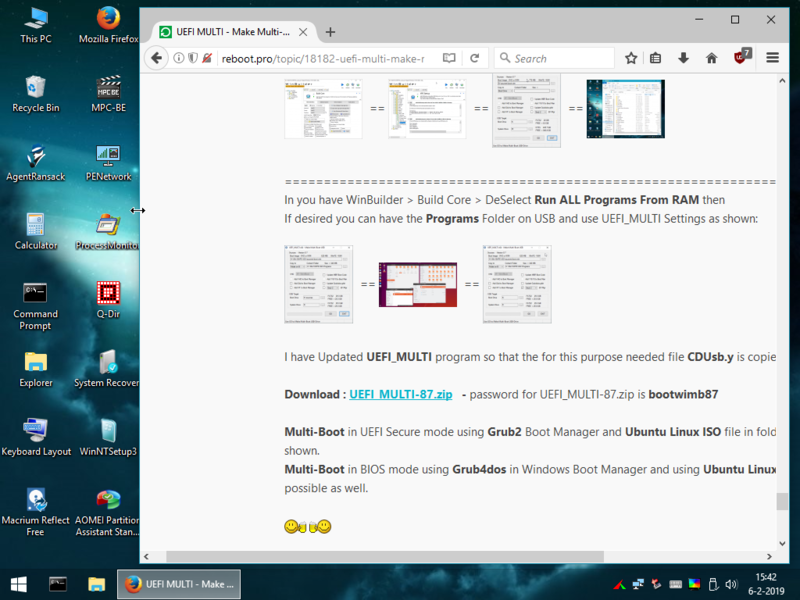 rem == for a UEFI/MBR-based portable USB-harddisk that can be used by UEFI_MULTI.exe. Win7 VHD's can NOT boot when located on GPT partitions and Win7 is not compatible with UEFI boot mode. then WinNTSetup can be used in WinPE environment to prepare the Boot and Installation Drives for Install of Windows 10 x64 as described below. 1 - UFD_FORMAT.exe and UEFI_MULTI.exe can be used to make USB-Stick bootable with Win10PE and Win8.1SE wim files. 2 - Download Media Creation Tool and use it to make Win10_x64 ISO file that can be used for fresh install of Windows 10.
to prepare NTFS partition of internal harddisk selected as Installation drive for Install of Windows 10 x64. Use R-mouse to mount Win10x64 Setup ISO file as virtual DVD-drive and then select (again) install.esd or install.wim in folder sources. Select your (hidden) internal FAT32 drive Z: as UEFI Boot Drive or select your FAT32 USB-Stick as UEFI Boot Drive. 4. After reboot then in Setup of Windows 10 use Skip when Product Key is asked for. You don't need a key since Microsoft recognizes legal hardware for install of Windows 10 x64 and will auto activate. Install on new hardware e.g. after adding SSD, requires to fill in Product Key for activation of Windows 10. UFD_FORMAT.exe and UEFI_MULTI.exe can be used to make FAT32 USB-Stick or MBR-FAT32 drive bootable with 10PE and 8.1SE wim files. so that EFI + Windows partition can be Restored together, since Restore of only Windows partition C will give EFI Boot failure. UFD_FORMAT.exe and UEFI_MULTI.exe can be used to make USB-Stick bootable with 10PE and 8.1SE wim files. To download a package of all NirSoft utilities (Updated every week), go to this Web page. then one can use WinNTSetup_x64.exe to read the Product Keys and to Reset Password of the selected Offline Windows User Account. After booting from USB with WinPE then in WinNTSetup use upper left program menu and select Offline Windows. 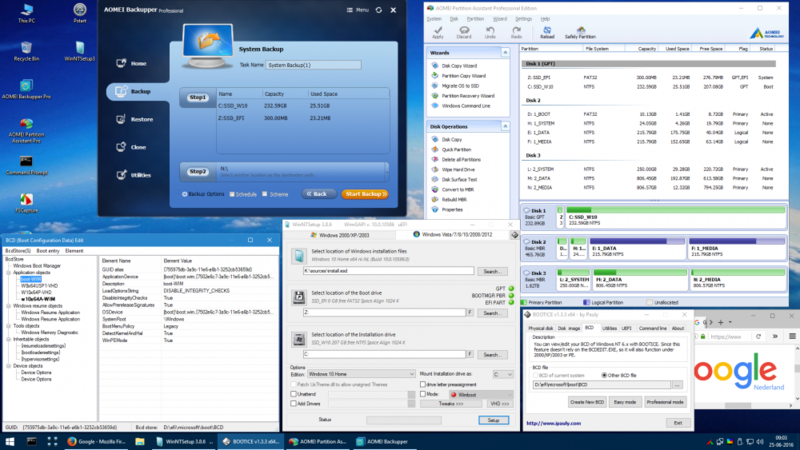 and using XP installed on NTFS partition or in VHD located on NTFS partition of second internal MBR patitioned harddisk. First Prepare XP Setup ISO file with integrated DriverPacks as described in How to prepare XP Setup Source ? and Copy XP Setup ISO file to the root of NTFS drive of internal MBR-harddisk of your computer. whereas you want to find ntldr (= renamed setupldr.bin) for install of XP located on NTFS partition of internal MBR harddisk. e.g. as partioned by Setup in Unused space when USB-stick is used as made by Media Creation Tool. This procedure is the standard for Install of Windows 10 x64 on Unpartioned harddisk and creates GPT efi + windows partition for booting in UEFI mode. 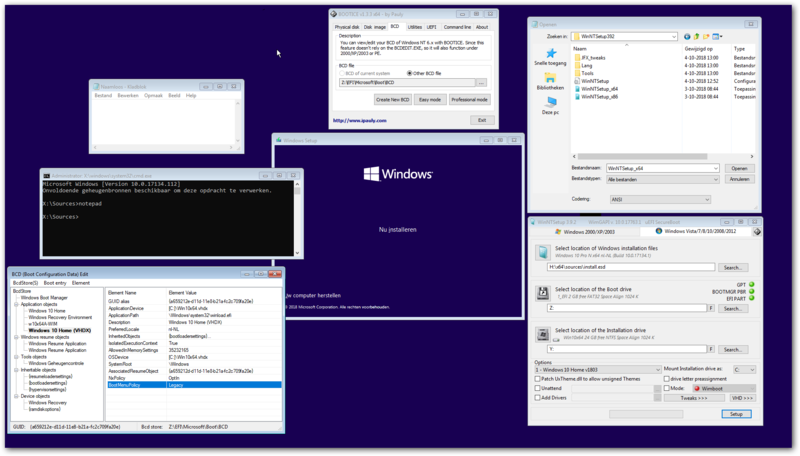 then WinNTSetup can be used in WinPE environment to prepare the Boot and Installation Drives for Install of Windows 10 x64 as described here. 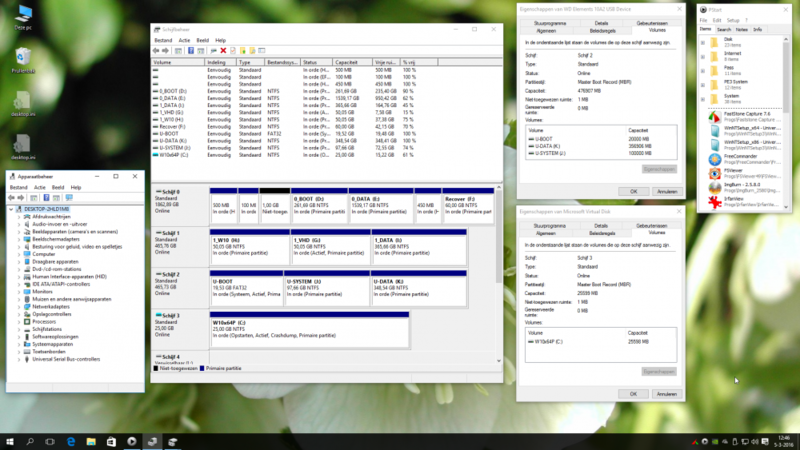 DiskPart is really needed to make efi partition having the proper Partition type GUID. UEFI booting of a MBR partioned harddisk for Win10 x64 installed to partition is possible only on some hardware. In that case it is possible to Install Windows 10 x64 on MBR harddisk with FAT32 Boot Drive and NTFS Installation partition. MBR-FAT32 USB-Stick with WinPE WIM files can always boot in UEFI and BIOS mode and GPT is NOT needed. 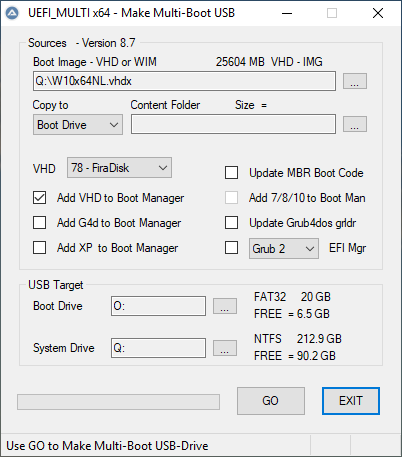 MBR portable SSD or USB-harddisk with WinPE WIM on FAT32 and VHD files on NTFS partition can always boot in UEFI and BIOS mode and GPT is NOT needed. 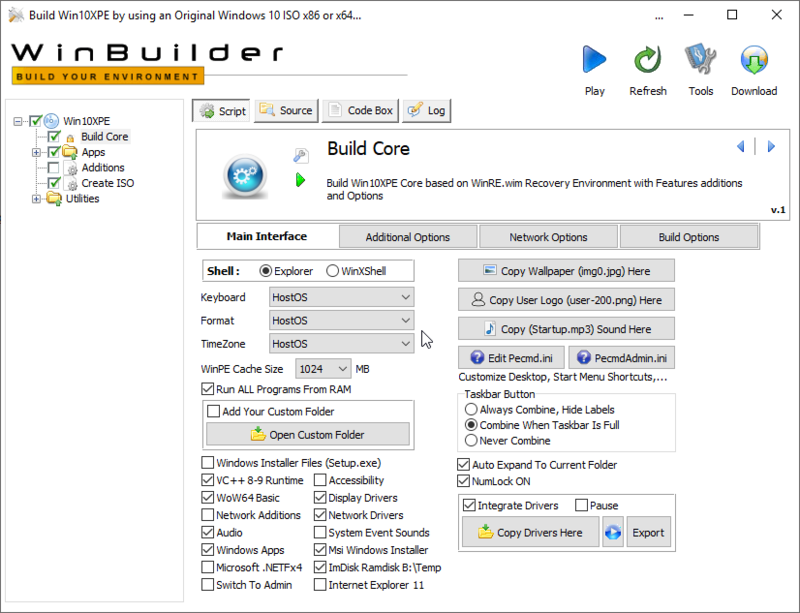 Another example is the Media Creation Tool of Microsoft that creates MBR-FAT32 USB-stick for Install or Repair of UEFI or BIOS computer. 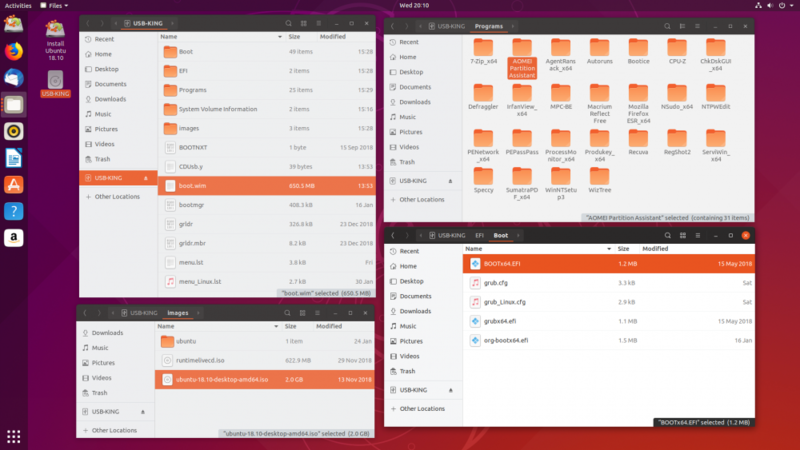 rem == Adjust disk number and partition sizes and label as necessary. BIOS mode booting is NOT compatible with GPT partitioning. For BIOS mode booting the Boot folder must be located on FAT32 (or NTFS) partition of MBR partitioned harddisk or USB-stick. XP and Win7 are not compatible with GPT partitioning and are not compatible with UEFI boot mode. XP has no access to GPT partitions and Win7 has access (read/write) to GPT partitions. XP and Win7 VHD's can boot in BIOS mode (= CSM mode), when located on NTFS partition of MBR partitioned harddisk. How to make Win10PE x64 boot.wim file is described here. and added file bootmgr.exe and file wimboot.ipxe to pxesrv\files folder. F8 hotkey can be used to select PXE boot in BIOS Boot Menu. After booting with Win10PE from Network you can use WinNTSetup with Win10 ISO file for Install of Windows 10. In WinNTSetup use R-mouse to mount Win10x64 Setup ISO file as virtual DVD-drive and then select (again) install.esd or install.wim in folder sources. 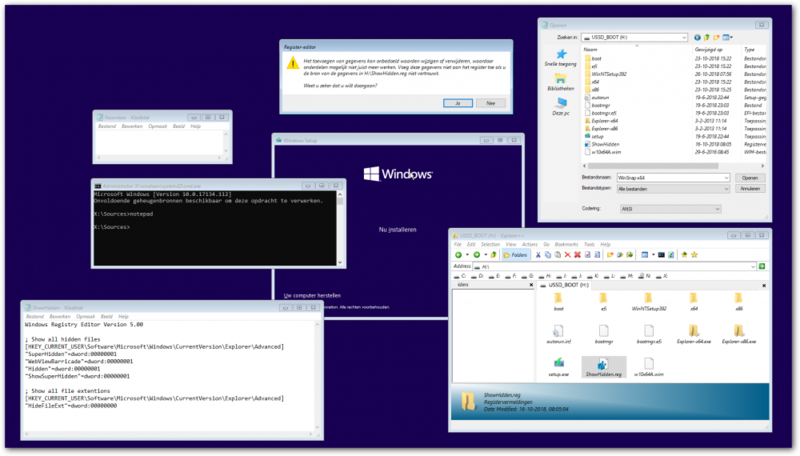 Cmd Window run notepad - File Open - All files - R-mouse Run as admin WinNTSetup x64 for method B. 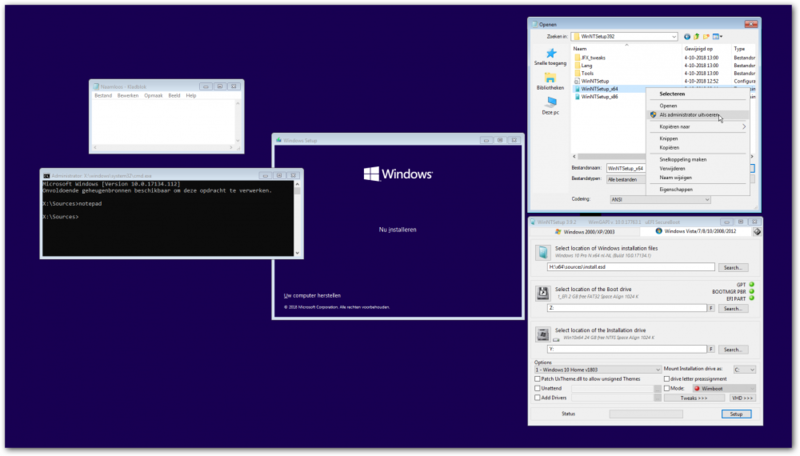 In BIOS and UEFI mode you can use WinNTSetup for Install of Windows 10 x64 on GPT partition. VHDX booting from portable SSD has the full power of Windows 10 x64. That means it has the drivers for all hardware and it allows to use all Windows programs. The Boot Menu for the VHDX is made only once with BOOTICE and reserved copies of BCD files can be used on other devices. Updating the portable SSD for Install of new versions of Windows requires only to add new Windows setup ISO file. There is no 4GB size limit for the ISO and you don't need to Integrate the ISO with any Toolpack and there is no need to Switch partitions. 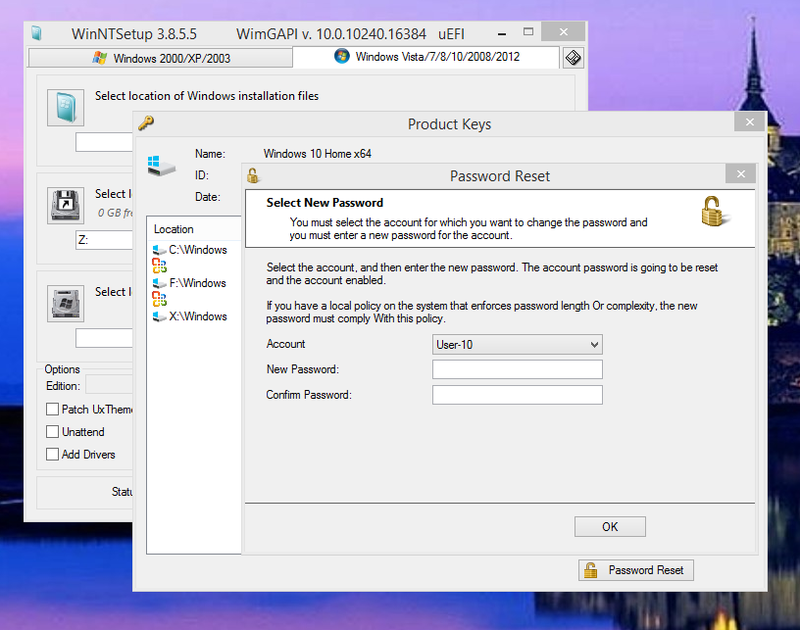 and allows then to Install any version of Windows by using WinNTSetup and Windows setup ISO file. There is no need to boot first in Legacy mode. With VHDX you can boot straight into UEFI Secure Boot mode. 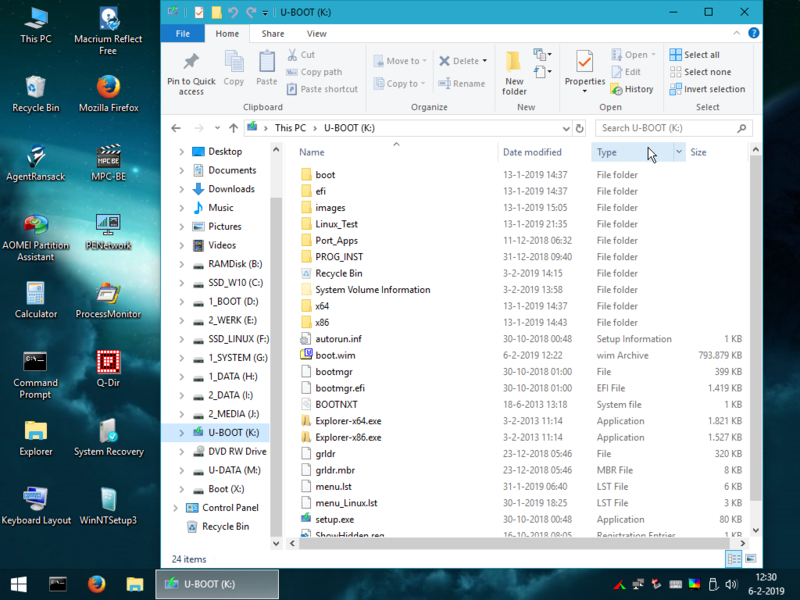 The content of AIOBoot-v0.9.8.17.7z is copied to USB FAT32 Boot drive. Do not auto install new Bootloader, but keep Windows BootManager as Bootloader. Linux Mint files bootx64.efi and grubx64.efi are used in EFI\BOOT folder for support of UEFI Secure booting. The grub folder of AIO is copied to boot folder made by Microsoft MediaCreationTool. AIOCreator.exe is used to Integrate Linux ISO files. then you need to use BOOTICE to Add UEFI entry. Often needed since UEFI Grub2 boot entry is easily lost. 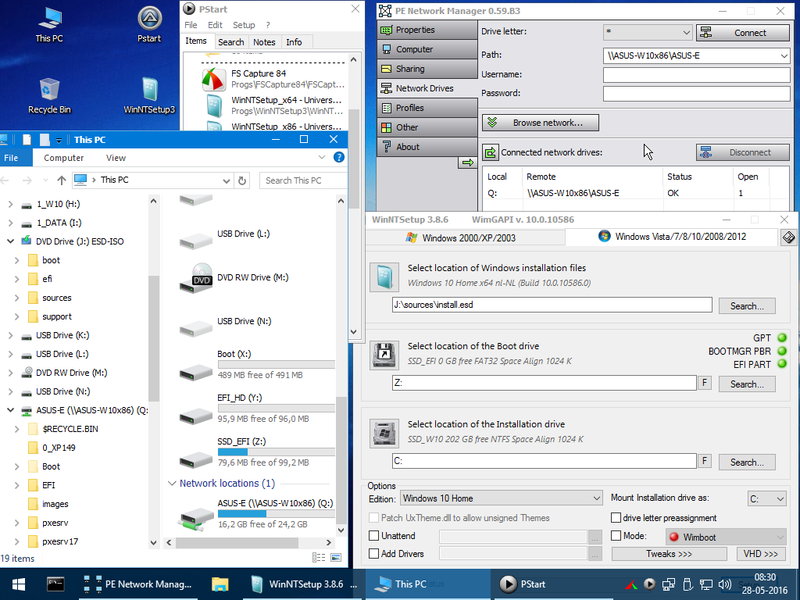 and have the Programs Folder on USB and then use UEFI_MULTI Settings as shown. I have Updated UEFI_MULTI program so that the file CDUsb.y needed for this purpose is copied to USB root.